In a more and more competitive market, cable operators are increasingly looking to deploy fiber alongside coax services to their subscribers. This delivers the best of both worlds – coax provides a known, well-understood connection that is proven to handle standard TV and voice calls, while fiber delivers the superfast broadband performance that consumers are now demanding for high-speed internet access and media streaming. There is now much greater competition between cable, fixed-line and cellular operators, leading to consolidation and a need for companies to differentiate themselves. The need to supply increasing capacity per subscriber is accomplished by deploying advanced technologies and fiber deeper into the network. Therefore, adding fiber to the premises (FTTP) to their existing coax offering allows cable operators to deliver new, additional products and services, retain existing customers and win new ones. 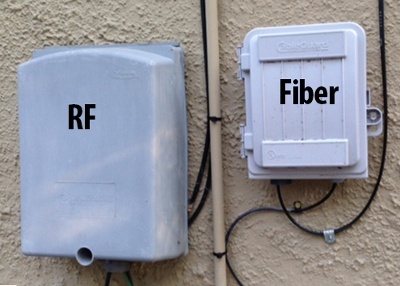 Traditionally, fiber and coax would have had their own connection box on the side of the premises. So, a network with both typically needs two closures, which adds to time, cost and the size of the installation. While doubling the number of boxes doesn’t quite double the time needed for the job, it can add 15 minutes or more to an installation – time that crews can ill-afford when they are trying to ensure greater productivity. Equipment costs also go up as you’re buying two boxes rather than one, both of which need to be maintained. Additionally, building owners are unlikely to be happy to have two boxes on their premises, taking up more space and potentially affecting the aesthetics of the property. The simplest way of solving the multiple enclosures problem is pretty obvious – to bring the two technologies into the same box. However, this is where the fundamental differences between RF and optical technology can lead to problems. Coax is a pretty rugged cable, whereas fiber is intrinsically fragile and can be damaged when handled. Many traditional cable installers aren’t yet fully up to speed with fiber and its intricacies, meaning there’s an increased possibility that one box installs will lead to craft errors that cause service calls. The same applies to routine maintenance/upgrades to coax – in a tight space, there’s a greater chance that fiber will be accidentally damaged. Again, this means unhappy customers, potential downtime and the need to dispatch crews to solve the issue, adding to costs. As mentioned before, many crews are still learning about fiber and how to handle it. For example, pre-terminated fiber is normally supplied at a specific length, meaning the slack needs to be stored within the box – but kept away from the RF components to avoid any damage during upgrades. What works best is a box that keeps the optical and RF layers apart, in separate compartments, with sufficient space to store excess fiber. To prevent accidental damage, the fiber compartment should be lockable, so that it can only be accessed by trained, authorized technicians – helping to reduce service calls and prevent vandalism. Ideally, the box should have an integrated splice platform, protecting the fragile fiber splices and a moisture-proof conduit entry for fiber to guard against damage from the elements. The communications industry is currently moving extremely fast. New technologies, such as RFoG and xPON, are increasingly being adopted, so operators need an enclosure that is fit for the future. It should be able to handle new pass-through optical signals and be expandable to accommodate passive splitting over multiple ports, a particularly vital feature for multi-dwelling units (MDUs). After all, no operator wants to go to the cost and time of replacing already installed boxes unnecessarily when technologies change. 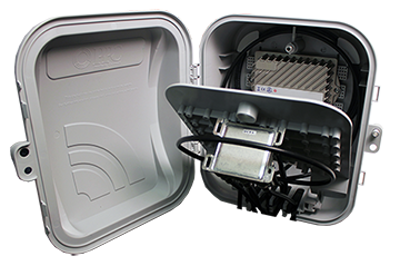 With the growth of combined coax and fiber networks, the need for a more compact, secure and purpose-designed single enclosure is growing. This can bring down installation costs, cut service calls and ensure maintenance is trouble-free, benefiting cable operators throughout the lifecycle of the deployment. To find out more about how PPC Broadband is meeting this challenge click here.